You probably know practicing healthy dietary and lifestyle habits can help prevent tooth decay and periodontal (gum) disease. But good habits could also lower your risk for a more dangerous type of disease — oral cancer. There are several risk factors for oral cancer, including those you can't do much about like your genetic makeup or unknown elements in the environment. But there are factors you can influence with your actions. You're probably familiar with the links between tobacco use (both smoked and smokeless) and oral cancer. But excessive alcohol use could also increase your risk, as can risky sexual behavior that could expose you to human papilloma virus (HPV) 16. And what you eat — or don't eat — could also influence your cancer risk. Research over the last half century has uncovered a link between diet and cancer. Cancer development seems to begin with damage to DNA, the genetic material that “tells” each of our cells what it is and what it does in the body. Substances called carcinogens found in the environment — including the foods we eat — can damage our DNA and open the door for cancer to development. But some foods also contain elements that protect our DNA from carcinogenic damage. Some of these are known as antioxidants, which protect cells from unstable molecules called free radicals. You'll find antioxidants, as well as other protective substances like fiber, vitamins and lycopene in plant-based foods, particularly fruits and vegetables. Eating a plant-based diet also means you'll eat fewer foods that contribute to the rise of free radicals like saturated fat, animal protein and nitrates (a chemical that occurs in some food processing). 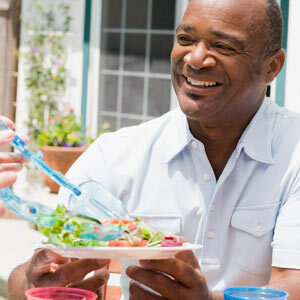 A healthy diet, along with quitting tobacco use and moderating alcohol consumption, will help not only preventing decay or gum disease, it will also drastically lower your risk for oral cancer.